Today, 22 students, from 9 different countries, came together for their first full day at the Global Youth Village. This group is one of GYV’s most diverse- in our 35 history! 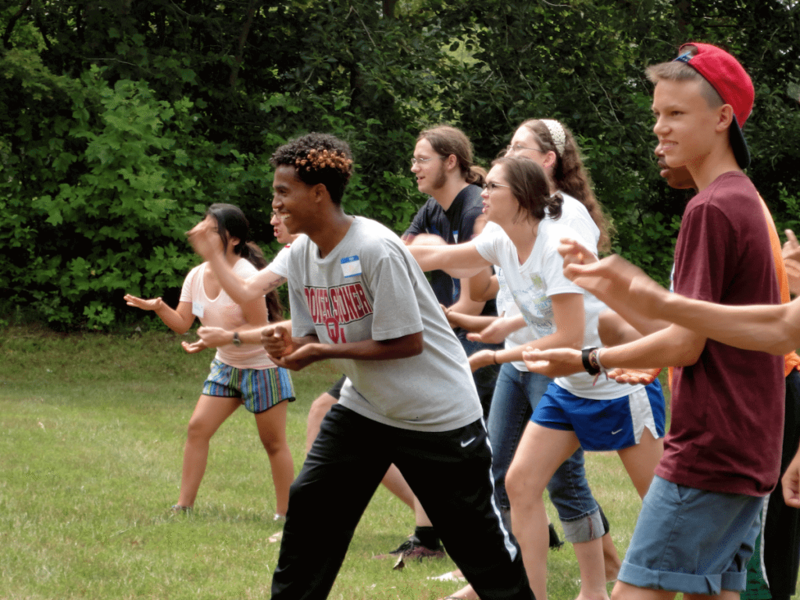 After waking up in their new “home away from home” – their cabins – students went off to breakfast to fill their bellies for the day’s activities. The meeting with Mr. Rash was followed by a series of group building games on the Sports Field. Small groups completed a “Hoop Pass” Relay followed by an all group game of “Rock, Paper, Scissor Tag”. The game is played by two teams; each team comes together and agrees on if they will be “rock”, “paper” or “scissor”. After setting their strategy, each team lines up to “face off” with the other team. Whichever team wins (remember, rock beats scissors, scissors beat paper and paper beats rock) tries to tag a member from the losing team. If a member of the losing team gets tagged, they must switch teams. The game not only produced a lot of smiles and laughter, but it also was a chance for the students to come together and begin working in teams. 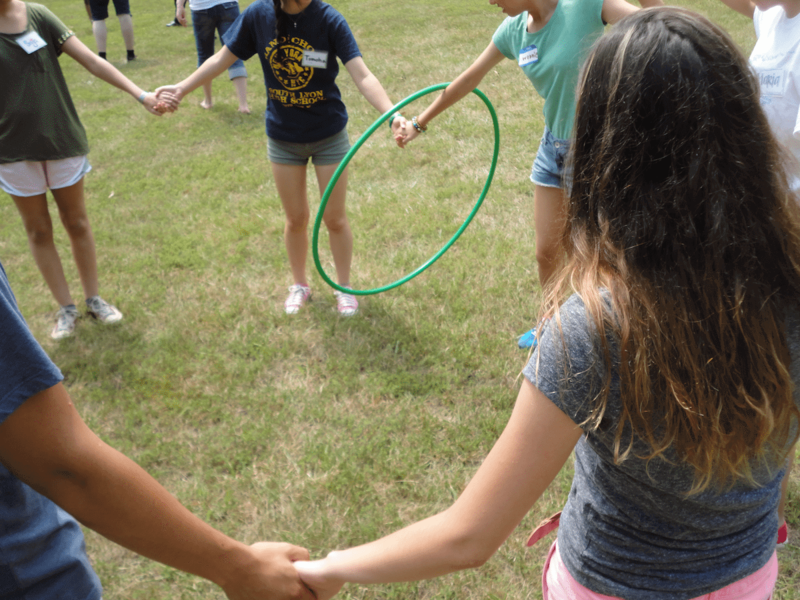 One of the key tenants of GYV is cooperative problem solving, and students practice that even through silly games! Naturally, a few students began to rise up as leaders of the games. Elijah from Arizona was a spirited leader of his group – calling his team together with “ALL HANDS IN” and creating a team cheer! 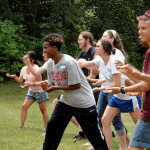 One great things about GYV is different students bring different strengths to each activity. Someone who is shy in one activity will step up and be the leader of the next! We’ll have to see who shows their inner leader in the days to come! Elijah from Arizona calls “All Hands In” during the Giant Rock, Paper, Scissors game. Jenny, from Kentucky, and and Tyrell from Brooklyn, join in. After working up a sweat playing tag on the field, students sat under the tent and had some time to show their creative side. Arts workshop instructor, Tony, led the students in a visioning exercise. He asked students to think about what they want to get out of their summer at GYV. What do they want to learn? What do they want to experience? After creating their Vision Pieces, students completed a Silent Gallery Tour, taking time to read and appreciate one another’s visions. Wennie, from Taiwan, works on her Vision Piece on Orientation Day. She is working next to her cabin-mate Haruhi, from Japan. Two common themes that came out of the exercise were: 1) wanting to make new friends and 2) wanting to learn about other cultures. These students certainly came to the right summer program, because that is what the Global Youth Village is all about! Here are Vision Pieces made by Naomi, from Crow Nation, and Maddie, from Virginia – both, hope to new friends at GYV. Namoi even got her new friends from Japan to teach her a few Japanese characters.